WASHINGTON — ObamaCare is driving down President Barack Obama’s poll numbers and has cancelled insurance plans of up to 12 million Americans so far. 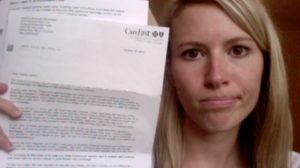 MyCancellation.com, a Tumblr blog, has users submit their photos of their health insurance cancellation letters to the blog. It has since become popular for Americans voicing their dissatisfaction and anger toward Democrats and Obama. The blog has at least 8 posted photos of letters, with people’s names redacted, per page. If all disgruntled and affected Americans posted their cancellation letter photos on this blog, it could crash the site. But, it is still a depressing look at how ObamaCare is costing tens of millions of Americans their individual health insurance plans that they liked. What about you? Have you lost your individual health insurance plan because of ObamaCare?